ThirtyFifty has a regular diary of wine tasting events for you to attend in Manchester. For 2019, we have teamed up with the Jurys Inn Hotel, centrally located in Manchester's city centre, a short walk from Deansgate station. We have Evening Wine Tastings that you can attend mid-week which are educational yet fun and great value. More dates will be added during the year. The evenings can be booked directly with us online by choosing a specific date or you can purchase an open-dated gift voucher so that the recipient can choose which date they'd like to attend. For upcoming dates please see below. If you are buying as a gift, you can order an open-dated gift voucher so that the date can be booked with us after your gift has been received. We'll automatically email you a link to the voucher once you have completed your purchase, or we have printed gift vouchers that we can post to you for £2 (select at checkout). Our evening Manchester wine tastings are refreshing and fun, but also easy for budding wine enthusiasts to get a solid grounding to help navigate the world of wine with confidence. A selection of canapés are served alongside the wines. 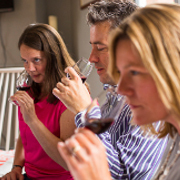 Weekend Wine Tasting Breaks and Saturday One Day tasting near Manchester in Frodsham. Join us for a brilliant day out, tasting 16 wines and a fantastic 3 course lunch. All our One Day Wine Courses are run on Saturdays, starting at 10.30am and finish at 4.00pm. Numbers are restricted to a maximum of 18 so there is plenty of opportunity to get to know other attendees and ask questions. Not found what you are looking for? Register your interest in attending a wine tasting event in Manchester by completing the form below. We can also host our wine tasting events for private groups or corporate wine tastings at various venues in Manchester.